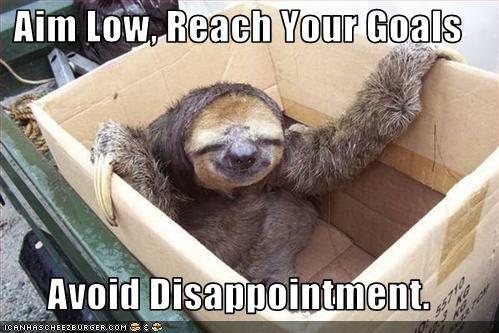 I’ve never been big into setting goals. Don’t know why, just never was something I put too much thought into. 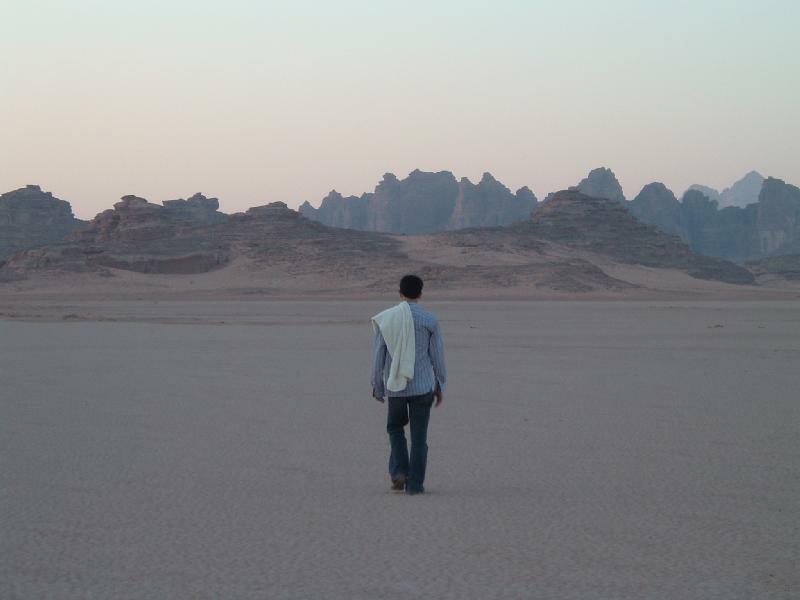 My goal is to walk over there and figure out where to go next. I always struggled with the “what are your future goals” part of an interview or job review, because answering “to have a job” really doesn’t sound very impressive. We’ve been taught that we should have goals in our life so we have something to focus on and work towards. If you tell people you don’t really have any goals in life besides not dying today, they think of you as some gypsy wandering through life. Without goals, and plans to reach them, you are like a ship that has set sail with no destination. My wife recently told me about a couple she met through her work and how the husband was very goal-oriented. Years ago he started working in a factory and told his wife that one day he was going to be the Plant Manager. He was such a good worker that he eventually became the youngest Plant Manager in the factory’s history. Goal achieved, end of story, right? Nope. He went on to become a CEO at the company and is still setting goals for himself as he nears retirement. When I started running at the end of 2009 I did it with a specific goal in mind: to run a half-marathon (13.1 miles). At the time I had never run in any type of running event (I walked in a few 5k’s) so I knew I was going to have my work cut out for me. As I gradually built up my endurance and my runs started getting longer, people would tell me we should run a marathon together. My response was always the same. 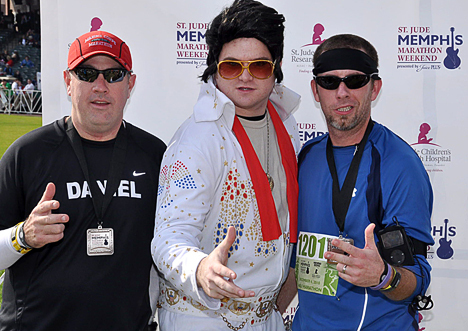 I'm either trying to do Elvis’ lip-curl or grimacing from the post-race pain. Me: I have NO desire to run a marathon and I doubt that I ever will. I don’t have any problem with people who run them. I get that it’s a big accomplishment that they worked so hard for; I just don’t want to do it. Even after running for a full year and completing the St. Jude Half Marathon in Memphis last December, there was no desire to run further distances. I was happy because I had achieved my goal. Setting another goal for something twice as hard didn’t, and still doesn’t, appeal to me. 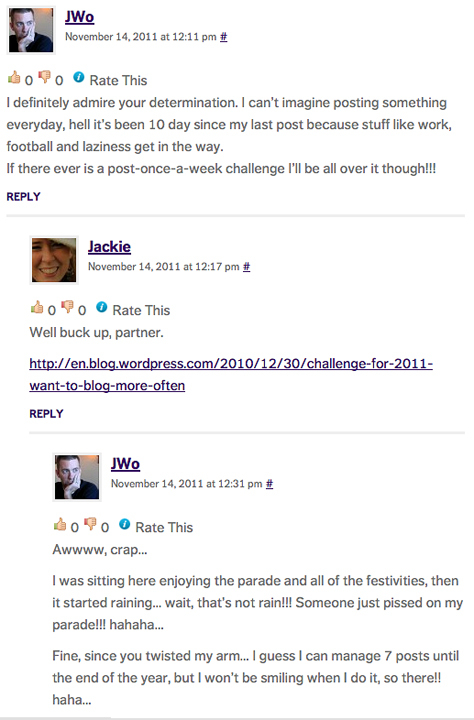 Since I started The Life of JWo back in August, I noticed that some of the bloggers I follow (listed on the right side under “Blogs that Make Me Laugh”) were taking part in WordPress.com’s Post a Day 2011 challenge. I admired all of the them from afar for taking up such a challenge because I know how much time punching out a blog post can take. In the span of 13 weeks, I’ve had 62 posts which averages out to just under 5 posts a week. That sounds great, except for the fact that I copied over NINE Travel Logs from previous vacations and my wife wrote THREE Tammy’s Tirades. Take those away and I’m down to 50 posts (3.8/week) which is a far cry from the 97 I’d have with the Post a Day Challenge. So earlier today I was trolling around on The Jackie Blog when I saw where Jackie wrote about being the Little Engine that Could and having less that 50 posts to write to complete her Post a Day Challenge. What was intended to be an encouraging note ended up coming back to bite me. I thought we were friends!!! I thought about how a Post a Month Challenge just doesn’t sound right and crunched the numbers. When I realized I’d only be obligated to make SEVEN posts until the end of the year I realized that this is the perfect goal for me. I’m heading to Mississippi for Thanksgiving, so those posts will practically write themselves. Then there’s all of the pre-Christmas shopping drama, Christmas itself and New Year’s, so this challenge is virtually a lock!! I’ll have SEVEN posts before I know it. Wait, does this count as one??? Gallery | This entry was posted in Daily Life and tagged daily life, humor, Jackie Blog, postaweek2011. Bookmark the permalink. Mississippi?!!!! Yeah, you’ve got it made. Especially if you go through Louisiana on the way. Don’t forget to come to Arkansas.